Yes we are doing this.. a green recipe. We all need more of it in our lives. Even when trying our best to be healthy it can be hard to stay inspired and excited by green veggies. Its funny – it seems easy for us to plan a Tart menu coming up with fun salads and veg dishes, but we still have that problem when cooking for ourselves when you walk into the supermarket and look at the rows of fresh vegetables and your mind goes blank – as if you have never cooked anything before in your life! This is when we came up with the green goddess. This is a quick, easy, cheap AND delicious recipe that is 100% good for you and gives you five a day in one helping. This is not so much a recipe we do on shoots, but one that we do at home (always requested by Lucy’s sister who named it the Green Goddess) when we feel like we need a bit of a health boost. 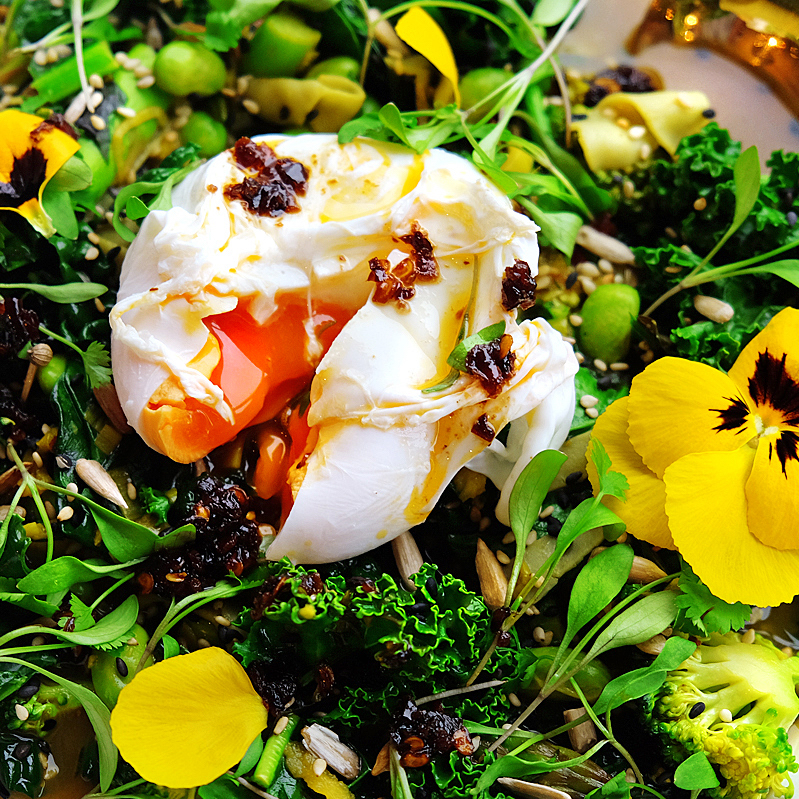 You can eat the Green Goddess at anytime of day, we often serve it with a poached egg on top – perfect for brunch, or lunch, or supper. Carb wise – this isn’t necessary if you are being super healthy, but we find if this is for lunch or supper you want it slightly more substantial. Try and go gluten-free – there are lots of options. We have just found this amazing alternative at Whole Foods which is Edamame Fettuccini (the only ingredients being soya beans and water, how they make fettuccini out of this who knows), we appreciate this might be difficult to get your hands on so we would suggest, quinoa, rice noodles, brown or wild rice (giving a wonderful nutty flavor) and kelp or soba noodles. When it comes down to the recipe, think of this as your starting point but go and make it your own, add or subtract whatever you wish, all depending on what veggies you like, and what is available, if the only thing that you have in the fridge is kale then just make a kale dish... there are no rules. We have added lots of green veggies in this recipe, but I would choose about 3 or 4 if you don’t want to buy the whole lot (that’s why we haven’t given specific amounts, on average you want a handful of each per person). We agree that it might sound a bit weird to have ginger and turmeric (and coconut water – we added this because it was in the fridge and is good for you, normal water is just fine!) alongside basil and dill but it works. It tastes really good and for the last time its really good for you. Hand full of mint, dill and basil roughly chopped. 1. In a large frying pan heat with a drizzle of olive oil or coconut oil and heat over a medium heat. Add the leek, garlic, ginger, chilli and sauté till slightly coloured, careful not to burn the garlic. Add the turmeric and stir over heat for a minute or so. 2. Add the sherry, stock, coconut water and miso paste and simmer for a few mins to reduce. 3. If you are making an egg to go on top this is the time to do it. And cook 4. Add your greens to mixture, stir into liquid and let cook for about a minute – you still want the greens to be crunchy. Stir in the noodles and season. 5. Serve into a warm bowl with egg on top, sprinkle with mixed herbs, chilli and salt and pepper.